When one hospital’s program for treating trauma patients was in critical financial condition, the effective model for change didn’t come from the health care industry: It came from manufacturing. This hospital’s redesign provided a perfect case for studying the transfer of operational ideas from manufacturing into health care. Work with my colleague, Nancy Lea Hyer, and trauma surgeon John A. Morris Jr. (both of Vanderbilt University), published in the Journal of Operations Management, spotlights these concepts at work at a major medical center. For teaching purposes, we also recently wrote a short teaching case on the same hospital. Our research shows that the transition from a traditional way of caring for trauma patients to a specialized, manufacturing-inspired focused model had a strong impact on the hospital financially, improved outcomes on the clinical side, and shaped a positive work culture. The concept of “focus”—specializing in a limited number of tasks in order to develop efficiency and effectiveness—has been a mainstay of operations strategy literature for more than 40 years. The fundamental idea is to reduce complexity so an organization can concentrate on doing fewer things better. Focus is not a new concept in health care. Recent decades have seen the founding of specialty hospitals, such as heart hospitals and ambulatory surgery centers. The idea is that clinical outcomes and patient needs can be improved, and money can be saved, by grouping together patients with similar needs. Yet, there is an absence of detailed case studies that show how the focus concept has been operationalized in hospital settings. At the U.S. academic medical center in the study, trauma care was delivered to patients much as it is at other hospitals in the nation. It was its region’s only Level 1 trauma center, where patients require aggressive and rapid resuscitation. In emergency services the “the golden hour” applies—i.e., the first hour of care is critical and can make the difference if a patient survives his or her trauma from a gunshot wound, a stabbing, a serious car crash, a dangerous fall, or an accident with machinery. Before our study, patients would arrive at the hospital’s emergency room, receive a diagnosis and initial care, and proceed to an operating room or intensive care unit on other floors. As patients recovered, they would be transferred to an open bed elsewhere in the hospital (note that transport is in itself a danger to trauma patients). Nurses on those floors weren’t specifically trained for trauma care, and physicians lost valuable time by having to go to rooms throughout the hospital to tend to trauma patients. The trauma department was also losing money. The hospital’s administration had discussed eliminating trauma care, but the hospital’s director of trauma was convinced that a more focused unit would provide better outcomes and improve financial performance. Funds were raised and the hospital created a dedicated trauma unit on one floor that had its own beds, equipment, X-ray facility, nurses, therapists, case managers, pharmacists, and other staff. Patients who came in to this unit stayed there until they were discharged from the hospital. Some surgeries and procedures were done in the trauma unit instead of in the OR and other specialized areas of the hospital. All in all, the care in the trauma unit followed what we call the focused hospital unit model—with strong attention to patient flow, and with specialized, dedicated staff to treat the patients through their entire stay in the trauma unit. Clinically, this arrangement had positive effects. Our analysis of patient streams three years before and after the creation of the new trauma unit shows that mortality rate stayed steady while the length of stay (LOS) for moderate and severe injury cases was reduced by 6.5 percent. Financially, the dedicated trauma unit was a success for the hospital. A $2 million deficit became $7 million in revenue. However, the financial gains did not come—as we had anticipated—from improved efficiencies because of the focus model. They came because the clinicians were trained to do a more careful job in documenting care, which led to an increase in revenues. Further, some surgeries that had once been done in the operating room were now done at the bedside in the trauma unit and billed to this unit (at a much higher rate) instead of to the hospital. Thus, surgeries in the trauma unit became a revenue-generating mechanism. Another factor in the financial turnaround was the ability of the trauma unit to now market itself as the region’s premier trauma center, which strengthened its ability to negotiate with health plans. The trauma unit also had an impact on the hospital at large; the bedside surgeries freed up operating rooms and the unit’s beds freed up bed space throughout the hospital. The workload on the trauma unit increased sharply during the studied period, which unintentionally forced some patients to be placed outside the trauma unit. It is our firm belief that without the creation of the focused trauma unit, and the streamlined processes that thereby became possible, the clinical and financial outcomes would not have improved and, in fact, would have been much worse than what we observed. Read the full paper, “Performance Analysis of a Focused Hospital Unit: The Case of an Integrated Trauma Center” in the Journal of Operations Management. The short case, “Redesigning Trauma Operations at University Hospital,” with additional co-authorship by Karen Brown, is available (with teaching note) from the Thunderbird School of Global Management and from Harvard Business School. 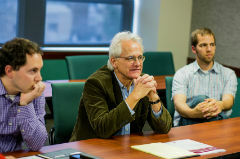 Urban Wemmerlöv is Kress Family Professor in Productivity and Quality; professor of operations and information management, Erdman Center for Operations and Technology Management at the Wisconsin School of Business.